Recently acquired on our French Buying trip. Matches were fairly unstable in their earlier days, and therefore those clever Victorians made special boxes to store them safely...well you did not want your "you know what" to catch on fire!@!!!! A C1890 French Antique Art Nouveau Sterling Silver Repousee Match Safe with Roses and a Cartouche in a Tres Francais motif. Set the stage for romance and unrivaled Magic! 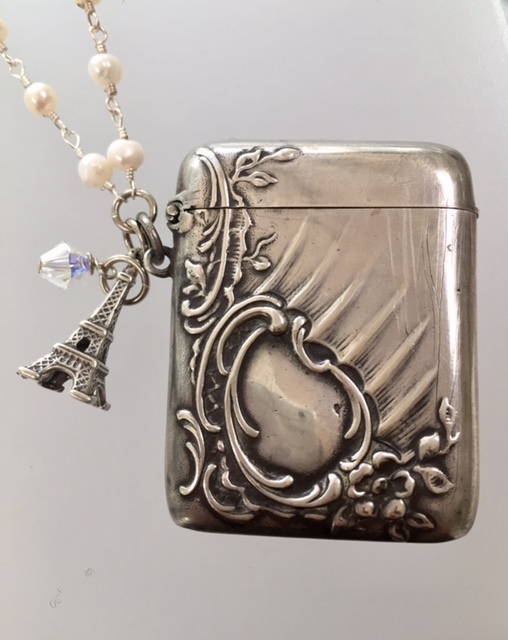 I added a Sterling Silver Eiffel Tower Charm and a Swarovski Crystal to dazzle the eye! The bottom has the match striker. 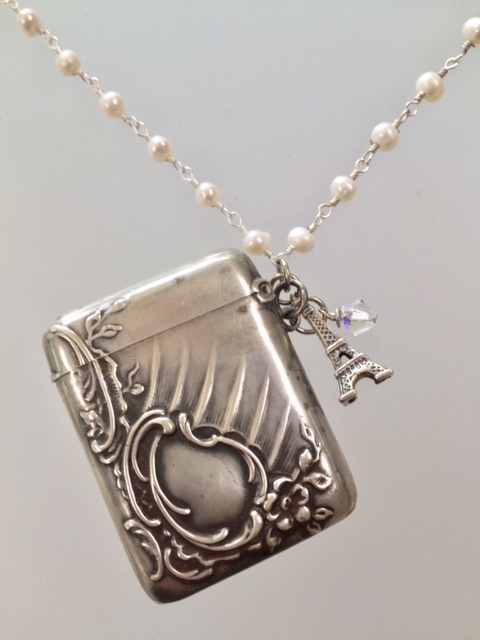 I suspended the piece on genuine white Freshwater Pearls. Could also be used as a pill box, or for family photos. Lid is hinged and functions well. Safe measures approx 1.75" by 1 3/8". Necklace is 30" Long. It has 2 hallmarks I cannot make out.